For the 24 hours to 23:00 GMT, the EUR declined 0.65% against the USD and closed at 1.1259. On the data front, the Euro-zone’s seasonally adjusted industrial production fell for the second consecutive month by 0.9% on a monthly basis in December, more than market expectations for a drop of 0.4%. In the prior month, industrial production had registered a fall of 1.7%. The US dollar rose against a basket of currencies yesterday, following stronger than expected US inflation data. In the US, data indicated that the US consumer price index advanced 1.6% on an annual basis in January, surpassing market expectations for a rise of 1.5% and compared to a rise of 1.9% in the prior month. Additionally, average hourly earnings rose 1.7% on a yearly basis in January, compared to a gain of 1.3% in the prior month. Meanwhile, the nation’s mortgage applications dropped 3.7% on a weekly basis in the week ended 08 February 2019, declining for the fourth straight week regardless of weak borrowing costs and marking its lowest level in 11 months. Mortgage applications had recorded a decline of 2.5% in the prior week. Moreover, monthly budget deficit narrowed less than market forecast to $13.50 billion in December, compared to a deficit of $23.20 billion in the prior month. In the Asian session, at GMT0400, the pair is trading at 1.1280, with the EUR trading 0.19% higher against the USD from yesterday’s close. 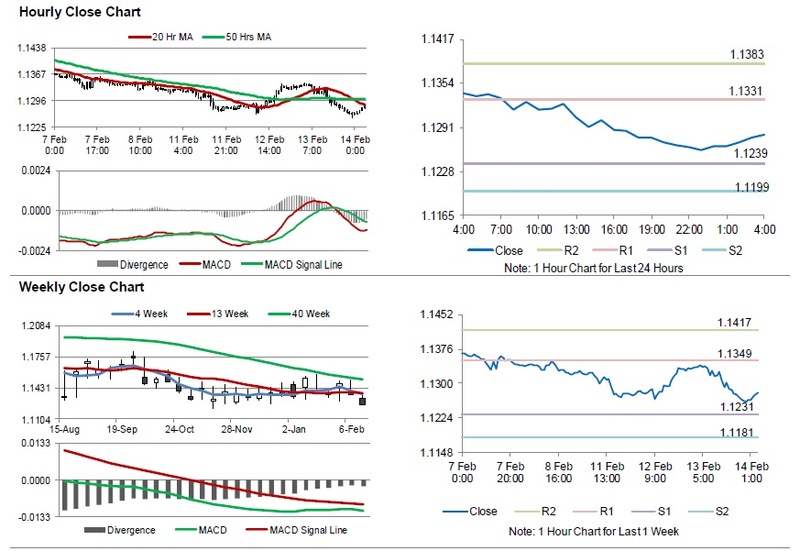 The pair is expected to find support at 1.1239, and a fall through could take it to the next support level of 1.1199. 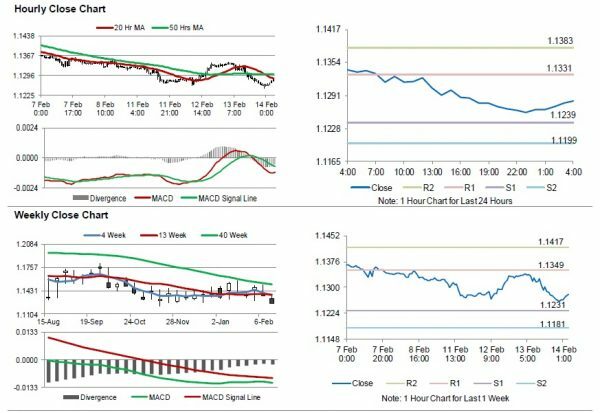 The pair is expected to find its first resistance at 1.1331, and a rise through could take it to the next resistance level of 1.1383. Going ahead, traders would closely monitor both the Eurozone and Germany’s gross domestic product for the fourth quarter, scheduled to release in a few hours. Later in the day, the US producer price index for January, advance retail sales for December and business inventories for November, along with the US initial jobless claims will be on investors radar.